UNITED KINGDOM -- A woman is warning dog owners after her puppy was viciously attacked by four other dogs. 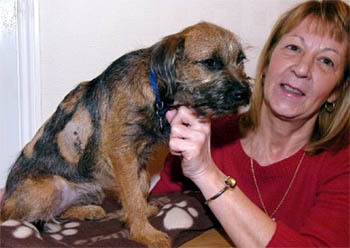 Barbara Armstrong, of Poolstock Lane, was walking her 23-week-old Border Terrier, Tia on Tuesday, December 13, when it was set upon by four other dogs. Mrs Armstrong is now warning others to keep an eye out in the Poolstock area following the attack. She said: “I was walking along the canal, and there was a man with four bull-terrier type dogs. Before I knew what had happened, Tia was surrounded by them and she is covered in cuts and bruises. The vet said she is lucky to be alive. “Since the attack, I have heard from other people in the area who said that his man and his dogs have done the same thing before. He didn’t even try to stop them and just walked off. GMP confirmed they have been made aware of the incident, but say they are restricted under the Dangerous Dogs Act as to the powers they have to follow up such incidents. The attack comes as law makers review sentencing guidelines for people convicted of dangerous dogs offences in England and Wales. The Dangerous Dogs Act 1991 is one of the most controversial laws on the statute book. Critics accused the then government of rushing it into law under media pressure, and that it has failed to achieve its aims. A government consultation in 2010 revealed the public to be still sharply divided on the law. But the Sentencing Council said its proposals would help magistrates who have to deal with the vast majority of cases brought before the courts. The Blue Cross charity says the law is not working, and it is time to shift the emphasis away from certain types of dog and place responsibility on owners. AUSTRALIA -- A brave Ipswich dad has told of how he shoved his right hand into an attacking dog's mouth to protect his daughter. 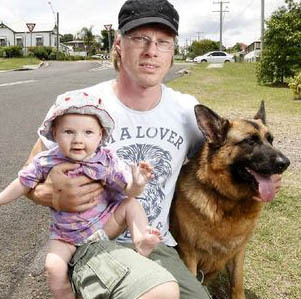 Ken Knebel was walking with his four-year-old German Shepherd, Sina, and pushing seven-month-old daughter Samara in a pram on Saturday when two large guard dogs ran at him. Only a few metres from the front driveway of his Macalister St home, Mr Knebel was forced to first protect Sina from the attacking dogs - one of which was a German Shepherd and the other he believed to be a German Shepherd cross. "One of them latched straight onto my foot," Mr Knebel said. "Then Samara's pram tipped over and she started crying." Distracted by the baby's crying, the dog that had latched onto Mr Knebel's leg released its grip. But instead of wandering off it approached young Samara. "I put my hand in the dog's mouth and started screaming for help," Mr Knebel said. "It probably all happened really quickly but it seemed like forever to me." A neighbour who heard the commotion ran out and helped the young dad fight the dogs off. "I'm just so thankful that it was me out there and not my wife - I'm not sure how she would have reacted to what happened," Mr Knebel said. "These dogs were scary - they were very aggressive." Despite the prolonged attack, Mr Knebel required only three stiches to a wound in his lower leg. He sustained deep puncture wounds to his right hand, which was still badly swollen yesterday. Ipswich City Council animal control officers have seized the dogs involved, which they said were unregistered and trained as guard dogs. Health and Regulation Committee chairman Andrew Antoniolli said council investigations were continuing. "The dogs will be held pending the results of that investigation," Cr Antoniolli said. Council was yet to determine whether or not charges would be laid against the owner of the dogs. 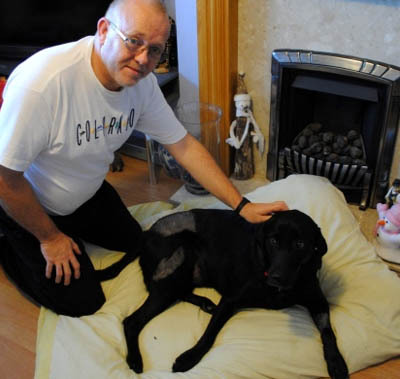 UNITED KINGDOM -- A Labrador was savaged and almost killed in front of its owner as they walked home on Christmas Eve. Paul Jarvis of Bedford Close, Grantham, was walking his dog, Smudge, along Sandringham Drive when a greyhound ran over and sunk its teeth into the labrador’s throat. Mr Jarvis desperately tried to drag the greyhound off his dog as it threatened to lose consciousness. Eventually he managed to get the greyhound’s jaws off his own pet, only for it to bite into the hind of the labrador instead. Mr Jarvis said: “I thought he was going to kill him when he had him by the throat. People living in Sandringham Drive came running out of their houses to try to help Mr Jarvis free his dog. He said: “About five people from three houses came out and were throwing bowls of water on the greyhound but it didn’t make any difference. The attack only ceased when the greyhound’s owner arrived on the scene. Someone in Sandringham Drive then called the police and Smudge was taken to Avenue Road Veterinary Surgery for treatment to the puncture wounds in his neck and the numerous bites to his hind. Mr Jarvis’ wife, Carol, said: “It was completely unprovoked - that’s what’s so alarming. It was a vicious attack. Mr Jarvis reported the attack to the police but was told that no action would be taken. COLORADO -- Two dogs matching the description of the dogs who attacked three people on Friday have been found dead, Aurora police said. It appeared that they were hit by a vehicle, Aurora police spokeswoman Cassidee Carlson said. "They were spotted on the side of E-470 at East 64th Avenue by a state trooper," Carlson said. That location is about 11.5 miles north of where the attacks occurred -- in 19200 block of East Gunnison Circle, near South Dunkirk Street and East Jewell Avenue in the Louisiana Purchase subdivision. 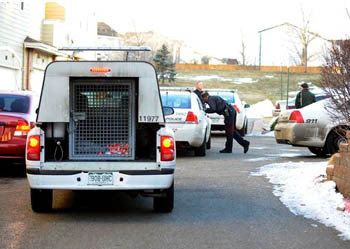 "Aurora Animal Care Officers took possession of the dogs. Aurora Animal Care Division will continue to investigate in an attempt to identify the owners of the dogs," Carlson said. Three people were injured in Friday's morning attack, which started when a woman was walking her small dog on a path. Two of the victims were treated and released. The condition of the most seriously injured woman -- the walker -- remains unknown. Cheryl Schultz told 7NEWS she was preparing to go to work around 6:30 a.m. when she heard a woman screaming and the dogs barking and she ran out to help. Schultz said she saw the woman trying to protect her small dog from two pit bulls so she ran out to help. After yelling to try and stop the attack, Schultz said she tried to pull one pit bull away. That's when both dogs -- a black pit bull and a brindle-colored pit bull-- lunged at her, she said. Schultz tried to run back home but was knocked to the ground. With the dogs distracted, the first woman and her small dog jumped into the back seat of a car whose driver stopped to help, Carlson said. Schultz's husband ran outside and helped her scurry back to their apartment. Shultz said she was inside her apartment, calling 911 when she looked out her window and saw a third person -- later identified as Brad Wall -- being attacked by the two pit bulls. Wall said the attack happened quickly and as he was defending his neighbor's life, the dogs turned on him. He said they knocked him to the ground. "They were mostly going for my throat. That’s why I had to block them up high and when I did that the other one worked on my legs," he said. The dogs bit his legs, tearing at his skin, jeans and arms, he said. "I was able to kick them enough to where there was a car parked here and as they went around to regroup to attack me again, I got up and jumped on top of the car," he told 7NEWS. 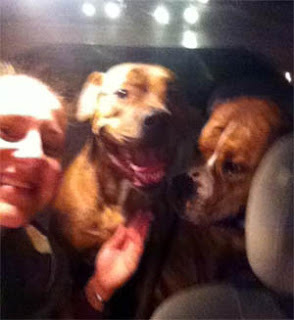 The dogs circled the car and then ran north shortly before officers’ arrived at the scene. Both women were transported to the hospital. Wall has had a tetanus shot, antibiotics and may have to undergo treatment for rabies. Schultz was released with several stitches to her leg. Schultz said she's never seen those pit bulls in the neighborhood and neither of them were leashed. She said the brindle-colored dog -- the one with black and brown markings -- was wearing a blue plaid neckerchief. UNITED KINGDOM - The owner of a dog named Big Daddy which went on the rampage leaving five people in hospital today said his pet deserved to be put down and he was “lucky to be alive” after being attacked himself. 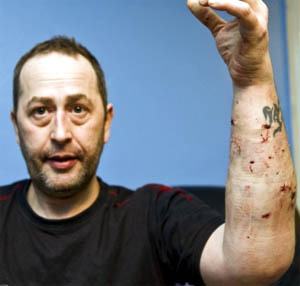 sustained by his own pet pit bull, "Big Daddy"
Jean Francois Vittemer needed 20 stitches to puncture wounds in his left arm after his dog of two years suddenly turned on him outside his Leith home. The 43-year-old said only the actions of his best friend, James Jenkinson, saved him from being savaged to death by the Johnson pit bull. Mr Jenkinson, 23, hit the dog with a pool cue in a bid to make it release Mr Vittemer’s arm during the attack in Cables Wynd House, off Great Junction Street, at around 3am on Thursday. The pair said they spent around 40 minutes wrestling with the dog as it repeatedly bit them, leaving both needing treatment at Edinburgh Royal Infirmary. Police have already confirmed that the dog would be put down following the incident. Mr Vittemer, who was born in the village of Toul in northern France but has stayed in his Leith flat for the last 14 years, said: “I think that Big Daddy has to be put down. I don’t want a dog like that. After attacking all those people it has to go. I loved that dog but not that much to want to keep him. I’m lucky to be alive now. “I got him from a friend two years ago and he has never been a problem. He was always very friendly. The only difficulty I had was him chasing his tail but I gave him more exercise and that stopped. “I had been sick with a stomach illness for five days so James had been looking after him at his flat on the floor above me. I phoned him to get Big Daddy back and give him a break, and James brought him to my door. I said, ‘Hello Big Daddy, how are you?’ and went down to pet him and that’s when he bit my arm. “His teeth were locked on to my arm and I could not get him off. I went down the corridor, punching him, trying to fight him off. I was trying to control him with his harness but then the harness snapped. Finally, Mr Vittemer and Mr Jenkinson managed to escape into a flat. Neighbour Ian Nolan, 41, a Tesco worker, and two women aged 38 and 42 were also injured by the dog. Police officers who turned up to help were said to have taken refuge in a bin chute cupboard to escape from the dog. A specialist police dog handling unit eventually managed to contain the animal. UNITED KINGDOM -- A family dog — and its owner — are nursing injuries at their Hucknall hame after they were both attacked by an out-of control Staffordshire bull terrier. Vicki Thornley (20), of George Street, was walking six-year-old Jack Russell "Sally" on St Mary’s Way in the town when the pet was savaged. Now police are probing the attack. A shocked Vicki tried to pull the Staffordshire off and was bitten on the hand. The attacking dog only released its grip when a member of the public came to the rescue and kicked it. The Staffordshire then fled. Vicki rushed Sally home with a gaping wound on the dog’s hind leg. Her stepfather, Alan Clark, applied an antiseptic powder before rushing the dog to the Buckley House vets’ surgery on West Street in Hucknall. Alan said: “When Vicki came through the door, she was just screaming that Sally had been bitten. We were all completely shocked. “It’s disgusting. Our first thought was to get Sally to the vet’s. Sally has been put on a course of antibiotics to prevent infection in the wound, while Vicki has undergone similar treatment after visiting her doctor. 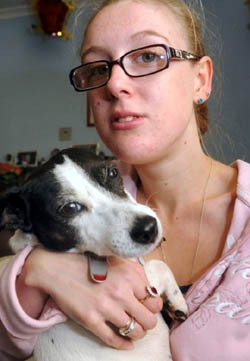 The family understand that another Jack Russell was attacked on St Mary’s Way on the same day. Now Alan (46) is planning to contact the RSPCA. The police have been alerted and are investigating. The dog that attacked Sally is described as black and white and was wearing a black collar with gold studs on it. Anyone with information is asked to ring the non-emergency police number of 101 or the free and confidential Crimestoppers hotline on 0800 555111. NEBRASKA -- She was on a leash but a routine walk ended violently for a 12 year old Schnauzer named Dagmar. The small dog died of injuries suffered in an attack by a larger dog in a quiet southwest Omaha neighborhood. Though not present during attack Kruse said a roommate moving out accidentally left open both the inside kitchen door and the garage door. So the dogs named Barley and Hops bolted when the Schnauzer and its owner walked by. However Kruse claims the attack was blown out of proportion and only one of his dogs was involved while the other just ran around barking. The Nebraska Humane Society’s Mark Langan said the victim couldn't identify which dog attacked so both were seized and the court will sort it out. The girlfriend of the owner of the bulldogs Amanda Limas said she witnessed the incident and she contends the Schnauzer owner killed his own dog trying to rescue it from the bulldog. However Humane Society investigators have reviewed vet reports on the Schnauzer. Langan said, “This dog died of injuries inflicted by one or two other larger dogs based on the bites the punctures and the broken ribs." The owner of the bulldogs has been cited for harboring dangerous dogs and his former roommate ticketed because he was home when they got out. The bulldog owner said his insurance will cover the $4,000 in vet bills on the Schnauzer but he will fight in court to save the dogs from being put down. Judge returns killer dogs to owner - probably because he knows he does not have to live next door to these dogs. Owner's friends and family thank God that their prayers were answered and give congrats all around to the owner. Yet, what about a kind word to the person sitting at home without their pet? The person who saw their beloved elderly dog killed in front of his face? Any word of sympathy to them? Of course not. TEXAS -- Two miniature ponies that were attacked by a pair of Rottweilers were being treated at a local equine hospital Friday. Doctors said one of the horses was in stable condition, and the other, which lost an ear in the attack, was in guarded condition. The biggest threat to the animals was the risk of infection, doctors said. The ponies, Sampson and Twinkletoes, were given to two little girls as Christmas gifts. 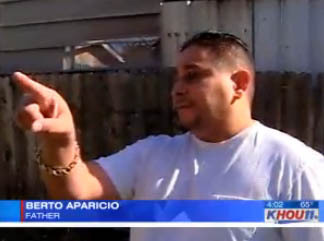 They were attacked in the back yard of a home near the Farmer’s Market in north Houston. Berto Aparicio, who bought the animals for his daughter and his girlfriend’s child, said the dogs burrowed under the fence to get to the ponies. "They were their Christmas presents," said Aparicio. "Our fence in the back is secure. I never would have expected those dogs to break through there. The thought never even crossed my mind." 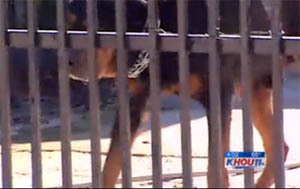 Aparicio said the Rottweilers belonged to a neighbor. 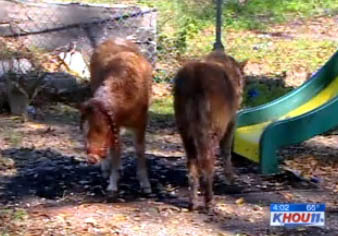 When the dogs attacked, witnesses said the ponies panicked and ran through a fence into the front yard of the home, but the dogs cornered them and attacked. 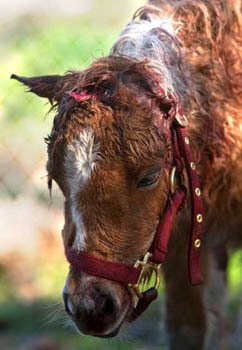 Both ponies were badly injured, and Twinkletoes lost an ear. "There were some guys telling us they seen it, that they were throwing rocks," said Roberto Torres, who lives in the house where the attack happened. "But they couldn’t help because the gates were locked." The neighbor who raises Rottweilers in his yard apparently heard the commotion and ran next door to retrieve the dogs. 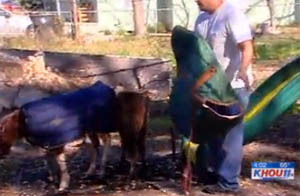 Aparicio put blankets on the horses, who were visibly weakened but still standing. "They’re pretty bad," Aparicio said. "I mean, one of them’s missing an ear." Workers at a nearby business say they’ve been frightened by the Rottweilers, who sometimes bark loudly at people walking down the street. 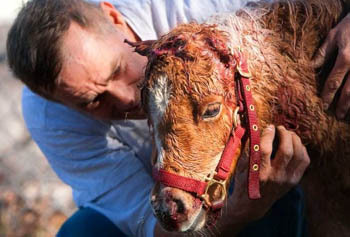 The horses were loaded into the bed of a pickup truck and taken to the equine clinic on Thursday. The two girls, aged 7 and 9, each got one of the ponies as a present on Christmas Day. Aparicio said, if the ponies survive, he will to move them to a plot of rural land where he lives. NEW YORK -- A Staten Island letter carrier, hurt when a dog "locked onto" his arm and bit him, has been awarded more than $125,000 by a jury, his lawyer said. Michael Velardi, 38, was attacked by a 60-pound pit bull on Sept. 30, 2008, while delivering the mail on Naughton Avenue, on the Dongan Hills-Ocean Breeze border, said court papers. The dog, named King, escaped from his yard and jumped onto Velardi, said the victim's lawyer, John J. Tracy. The animal "locked onto" Velardi's left forearm and only let go after the letter carrier punched it several times in the face, Tracy said. King continued attacking Velardi, who tried to escape by jumping onto a car hood. The dog didn't relent, forcing Velardi to scramble onto the vehicle's roof, Tracy said. The hair-raising episode finally ended when the son of one of King's owners pulled him away, said the lawyer. "It was a pretty vicious attack," said Tracy, a partner in the Castleton Corners law firm of Tracy & Stilwell. Velardi, a Great Kills resident, suffered a torn arm muscle and two complex lacerations, said court papers. His injuries prevented him from working for almost two months, and he incurred about $4,000 in medical expenses, said Tracy. Velardi sued the dog's owners, Delinda Mascolo and Rose Gardini, in state Supreme Court, St. George. The jury awarded him $125,952, Tracy said. Lawyers for the defendants did not return telephone messages left last week seeking comment. KENTUCKY -- A 10-year-old Louisville girl is lucky to be alive after an, incident with two neighborhood pit bulls. Haley Glaab was rushed to Kosair Children's Hospital with several dog bites and the dogs were taken by Metro Animal Services. Haley is healing. She has about 10 puncture wounds in one leg, two in the other and two bite marks on her wrist. She and her family know it could have been much worse. Haley remembered what a teacher once did when she was attacked by a dog. “I played dead,” she said. The dogs then left her alone. “There was no way we was going to make it. We couldn't outrun those two dogs,” Maricca Glaab said. Haley's uncle ran out and scared the dogs away. “It's a scary thing to happen when your child gets attacked by two dogs and you don't know, you know, what to do to take that pain away,” Maricca Glaab said. Haley’s mom said it was the first time she'd ever seen the dogs and she hopes it was the last. “I think that they should be put down, just for the safety of my children and everyone else's children,” Maricca Glaab said. What happens to the dogs is up to Metro Animal Services. The agency has the dogs under a mandatory 10-day quarantine while it investigates what happened. MAS will then determine what's in the best interest of public safety. Police initially responded to the incident after several 911 calls came in. They then notified MAS, which took possession of the dogs. The dogs' owner is expected in court next month as part of the investigation. 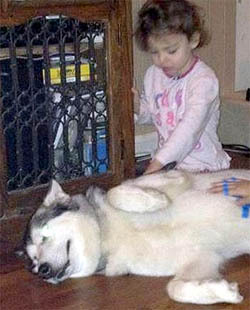 UNITED KINGDOM -- Jorja Caze-Ramscar was dragged off a chair by the crazed Alaskan malamute called Luna. 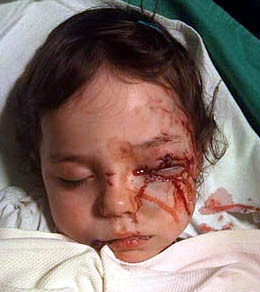 The husky-type beast locked its jaws around the little girl's head and chewed her face. Her mum Karine, 36, said: "They were just about to have dinner and the dog was next to Jorja. "It dragged her on to the floor and attacked her face. The dog had a big mouth. It was chewing on her face. "She thought it was going to kill her. There was blood everywhere." 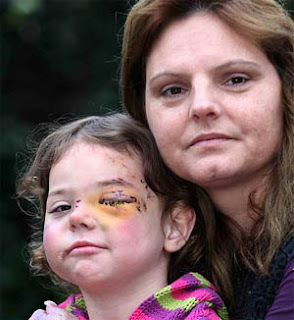 Jorja had 20 stitches after the terrifying attack on Friday in Dunstable, Beds, and needed specialist eye treatment. The 15-month-old dog belongs to her father Clive Ramscar, 42, and the mauling took place at his house. He and Karine split two years ago and their daughter divides her time between them. The dog was not put down but has been sent to stay with another family. 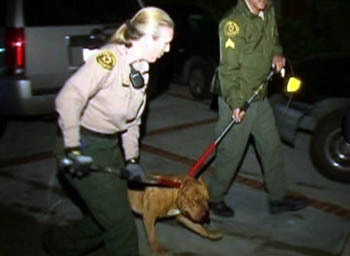 CALIFORNIA -- A pit bull shot by Contra Costa sheriff's deputies Tuesday night survived its injury, and Animal Services officers will house the animal while deciding what to do with it. A deputy shot the dog about 6:45 p.m. after it attacked and bit a police dog during an arrest of its owner, spokesman Jimmy Lee said. Witnesses reported the suspect, 29-year-old Brian Vorum, acting weird near the Bethel Island and Gateway roads. He threatened passers-by and damaged property, Lee said. While deputies searched the nearby Bethel Island Golf Course they encountered the pit bull, which behaved aggressively. A deputy pepper-sprayed it, and it ran. Vorum fought when deputies tried to arrest him, and during the melee the pit bull returned and attacked the police dog, Lee said, prompting a deputy to shoot. Vorum went to County Jail in Martinez on suspicion of parole violations and resisting arrest. The dog went to a veterinary office in Antioch for emergency care. Wednesday morning it was taken to the county Animal Services office in Martinez. Deputies were not seriously hurt. Information about the condition of the police dog was not immediately available. AUSTRALIA -- The owner of an eight-year-old terrier attacked by another dog last August was promised fortnightly payments to cover vet bills and the cost of a blood stained winter coat – but she still hasn’t received a cent. attacked by a bull terrier in August. Miranda Croft, 71, was walking her daughter’s dog, Teddy, on Chisholm Street back on August 16 this year, when she suddenly felt threatened by a bull terrier bearing no collar. Gathering Teddy up in her arms, Ms Croft went to walk away but was chased by the bull terrier, who jumped at her, biting her arm and thumb before clutching onto Teddy. Both she and Teddy were then dragged along the footpath, Ms Croft being face-down clinging onto the lead. Luckily, Ballarat man Glenn Bye was able to intervene, kicking the bull terrier and bashing it with a piece of wood until finally Teddy was released. Ms Croft said the bull terrier was out of control and then went and attacked another dog in a nearby yard. Police eventually used capsicum spray to get it under control. The ordeal left Teddy with a number of deep wounds including on one of his legs, and his chest. 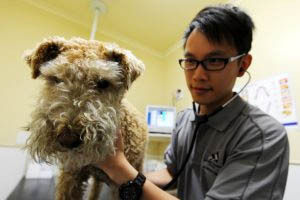 He spent the night at the Ballarat Veterinary Practice and racked up a bill of more than $300. Ms Croft’s winter jacket was torn and soaked in blood. Following the involvement of police and the ranger, the bull terrier owner agreed to pay Ms Croft’s daughter for both the coat and vet bill through fortnightly payments. But more than four months on, the pair still have not received a cent. “It seems strange something like this can happen and a person can get away with it,” Ms Croft said. “I feel indignant that no payment has been made to repay my daughter’s vet fees. Nothing can really recompense the shock and trauma and pain – and it was a really painful experience. Ms Croft’s daughter, who preferred not to be named, said she was frustrated by the lack of responsibly shown by the owner, and the lack of compassion in making the payments. “It’s more the principle of it, the fact this woman had given her word and she hasn’t made good on her word,” the daughter said. A City of Ballarat spokesperson said that the owners of both attacked dogs chose not to prosecute the owners of the bull terrier, and that a compensation agreement was reached between all parties. “As agreed, City of Ballarat provided the owners of the bull terrier with payment details for the victims. City of Ballarat has had no further involvement with the case,” she said. The bull terrier was put down. WISCONSIN -- New evidence entered Wednesday in Green County Court suggests a woman charged with animal mistreatment has a history of neglecting Great Dane dogs. Kathy J. Williams, 55, is scheduled for a jury trial in late February on five counts of mistreating animals and two counts of providing animals with insufficient ventilation. She and three others were charged after 42 dogs, mostly Great Danes, were seized in May from a home near Brodhead. Williams has pleaded not guilty to all charges. Williams was cited for animal neglect multiple times in Fitchburg and Madison in 2006 and 2007, according to accounts from Fitchburg police and Dane County Animal Control presented by prosecutors as evidence in the Green County case. A Fitchburg building inspector denied a kennel application for Williams' residence in October 2007 after finding 14 Great Danes living "in various rooms in the first floor and basement" with "strong odors of urine, piles of feces and an infestation of flies." She was cited for barking dogs on several occasions in the weeks following the inspection, according to documents filed in Green County Court. Earlier that year, Williams reportedly was keeping 15 Great Danes at a residence on Madison's west side. Animal control officers responded to numerous complaints that the dogs were "running at large, biting neighbors and pedestrians," according to court documents. In the early months of 2006, Dane County Animal Control found 20 adult and puppy Great Danes in her care at a residence on Madison's south side, according to the documents. Officers "observed piles of feces in the yard around the residence after responding to numerous complaints that said Great Dane dogs were running at large and creating a nuisance in the neighborhood," according to the documents. Care for the dogs seized in May has cost Green County almost $48,000. The Green County Humane Society has found homes for all eligible dogs and their 17 puppies except for one, Elle, a 1-year-old Great Dane. Williams' case is scheduled for trial Tuesday, Feb. 28, and Wednesday, Feb. 29. Among the three others charged with mistreating the dogs, Allyson Williams and Donovan Williams pleaded no contest to some counts and are in deferred prosecution. The case against Melissa Harrel is pending. 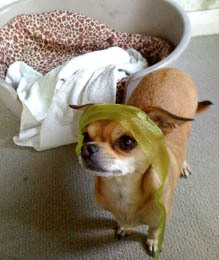 NEW ZEALAND -- Dannevirke Police are appealing to the public to help identify the owner and dog responsible in a vicious attack that mauled and killed a much-loved pet chihuahua. Robyn Cornish was walking her 2-year-old dog, Pixie, about 6pm Wednesday last week, when a pit bull-cross attacked on the corner of High and Cole streets. Both dogs were on leads. "The pitbull saw Pixie and just went for her," Ms Cornish said. "It all happened so fast. The attacking dog was on us so quickly. "Pixie screamed and screamed. Oh my God, it was horrendous. I just can't get the sight and sounds of that out of my head." Ms Cornish and an unknown resident from Victor St were rolling in the gutter together trying to drag the pit bull off Pixie. "I had my fingers up the pit bull's nostrils, someone else had its jaw, but it was locked into the attack," Ms Cornish said. "There was blood everywhere, I was covered in it and after it was all over, Pixie died in my arms." Dannevirke Police and an after-hours security person employed by the Tararua District Council attended the scene but the attacking dog and owner had fled. Dannevirke Police Constable Maxine Welsh said the attack was concerning and police wanted to locate the owner of the dog. The owner was described as a slim-built male Maori, who appeared to be aged in his early 20s, wearing black pants and a white singlet. PENNSYLVANIA -- A dog that was adopted earlier this month from the SPCA attacked its owner at her Lansdale home, police reported Tuesday. The woman, whom police did not identify, suffered numerous bites to her right arm and was taken to Lansdale Hospital for treatment. Police were called to the Mount Vernon Street residence at 5:45 p.m. Friday and officers heard a woman screaming inside the home. When police opened the door, the dog, described as a black Labrador mix, jumped over the kitchen canine barrier and ran toward the officer. Police were able to use a dog noose to control the dog and place it in the patrol car. The woman was found bleeding on the kitchen floor. She said she was walking past the dog when it bit her right hand. She said the dog had such a strong grip on her that she could not free her hand and began using her other hand to break the dog’s grasp. The dog became even more aggressive and bit her multiple times. She yelled for her child to call 911 and to take safety in an upstairs bedroom. The victim told police she had just adopted the dog but she could no longer handle or deal with it. The SPCA was advised of the incident and agreed to pick up the dog. They also provided documentation showing the dog was current on all its shots. This documentation was forwarded to the Lansdale Hospital emergency room which forwarded it on to the Montgomery County Health Department. 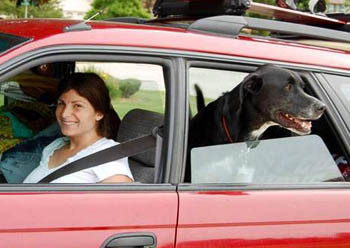 COLORADO - Dogs often are called man’s best friend and seen as an integral part of some families. But others see them as nuisances and a problem around livestock. Local resident Devon Pollack learned that the hard way when her dog, Bula, was shot after he attacked and killed at least two chickens on a man’s property during the Thanksgiving weekend. chickens. The two are seen here in Pollack’s car. Pollack left Bula in a friend’s care when she went to Michigan to spend Thanksgiving with her family. She used to take Bula with her to Michigan when she lived on the Front Range, but she has stayed in Durango the last two years because she didn’t want to leave Bula, whom she called family, at home or pay the hundreds of dollars it would cost to fly him. There isn’t a fence around the yard of the friend’s home, so Pollack bought a cable leash to tie to the house. The day before Thanksgiving, Bula was let out of the house without the leash and ran after something, Pollack said. The friend called after him and heard a gunshot a few minutes later but didn’t associate the two. It wasn’t until later in the day that the friend discovered Bula had been shot and killed in the yard of Bruce Bell, a neighbor who lives north of the friend’s property on East Animas Road (County Road 250). Bula was chasing Bell’s chickens and killed at least two of them before Bell’s friend shot the dog. Bell said the shooting was justified. Bell said this isn’t the first time a dog has killed his chickens, and dog owners never offer to pay for the chickens or property destroyed by the animals. Patla said this is about the second time a dog has been shot in the last six months. Landowners are encouraged to call Animal Control before taking action against a dog, but Patla said few do. While Pollack said she is devastated about the loss of Bula, a Great Dane-Laborador mix she adopted from a shelter 7½ years ago, Bell’s friend was within the law. It’s legal under Colorado law for landowners to shoot dogs when they are harassing livestock. But Pollack is trying to change that. [This woman wants us to have sympathy for her dog, but where is her sympathy for the chickens? Yes, it is a livestock animal that was being raised for eggs/meat, but that does not mean it cannot suffer terror and pain when being mauled to death by her "family member". I no longer live in Durango, but even here in Pueblo county, I raise chickens. They serve to feed my family and also provide a minimum of $50 a week income with their eggs. I have had dogs attack and kill chickens in my yard (which is surrounded by a 36'' high chain link fence). Dogs that are running loose and only come to the fence line, I chase away and try to find out where they come from so I can talk to the owners. If they don't have tags I call Animal Services, sometimes they come pick them up, sometimes they don't. The first time I had a dog kill some chickens, I was able to confine the dog in my garage and wait for Animal Control. They showed up, I showed them the dead chickens and the dog with blood and feathers still stuck to it. The officer had me sign a paper and then caught the dog with a catch pole, drug it to his truck and confined it. He said that since it didn't have tags it would be taken to the shelter and if an owner came forward they would have to pay the damages for the dead livestock, pay a ticket for a dog at large and pay the impound fees. Considering that it killed 5 chickens, the fees would be over $300. If no one claimed it within 3 days, and since there was evidence that the animal had killed livestock, the dog is not considered adoptable and would automatically be euthanized. Since then, I have called the pound twice more on dogs that have killed my animals simply because I was able to confine them. Mind you, these were dogs that when I approached them, did not act aggressively to me. They listened when I told them to 'drop it' and 'sit'. I will not endanger myself over someone else's dog. Unfortunately, I have had to shoot three dogs myself. Two dogs were aggressive towards me when I approached them (they lunged at me, growling and barking), the third actually bit me on the leg before I was able to shoot it. Dog owners are required to obide by the leash law. I don't care if your dog is the most lovable, cuddly puppy when he is in your home. If you dog approaches me or my kids in a threatening way, attacks a person or livestock, especially in my yard, you better believe I will shoot it dead. KANSAS -- A 10-year-old Salina boy was treated at StatCare for a puncture wound to his face Wednesday after he was bitten by a friend's dog, according to a police report. The boy told police the husky mix bit him on the face when he went to pet it about 1:15 p.m. at 226 S. Third, said Lt. Scott Siemsen, criminal investigation commander with the Salina Police Department. A worker with the Salina Animal Shelter retrieved the animal and cited owner Jeffery Lance for allegedly having a dog at large, Siemsen said. TENNESSEE -- Nicole Andree has spent nearly a year and $17,000 in legal fees trying to save the life of her pit bull - boxer mix Prada, who remains locked up in Metro Animal Control after fighting with neighborhood pets in January 2011. Two courts have ordered that the 4-year-old dog be euthanized, but Andree vows to appeal the case until Prada is allowed to return home. The case is set for another hearing in Davidson County Circuit Court on Jan. 27.
didn't "attack" other dogs. She believes it "fought"
Cases such as Prada’s raise questions about whether the breed is violent or misunderstood, and often leave courts to weigh neighbors’ conflicting testimony. Two East Nashville pit bulls that killed a neighbor’s Chihuahua last year were granted a reprieve when a judge decided to spare the dogs if they had microchips implanted and if they were prevented from running loose, even in their own yard. Ladebauche was not aware of any recent cases in which an owner prevailed once a court had ordered a dog destroyed. Prada’s troubles began in January 2011 when she lived with Andree in Forest Hills and a houseguest accidentally let Prada out of the house. Andree, exercising in the woods behind her house, didn’t realize the dog was missing until half an hour later. She called for Prada from a balcony while two friends searched the neighborhood. She called Metro Police when her friends told her Prada had been locked in a neighbor’s garage after a fight with a dog there. Prada later escaped and got into a fight with a different neighbor’s dog before police arrived. According to the police report, responding officers found Prada tied to a tree. And, police found a neighbor, Cindy Chamness, with a bite on her hand. 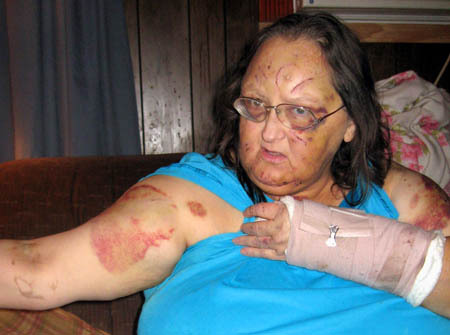 She said Prada had attacked her German shepherd. Chamness was bitten when she tried to break up the dog fight, but the report does not say which dog bit her. She declined to comment on this story, but her husband, Jay Chamness, said in an email to The Tennessean that his wife put her hands in the middle of the fighting dogs and she believes she was partially clipped by her own dog. She does not think either dog intentionally bit her, according to her husband. While the officers were interviewing witnesses, Prada escaped again, ran across the street and got into a fight with four more dogs, the report said. “At that point, an officer (used a Taser on) Prada,” Metro Police spokeswoman Kristin Mumford said. With help from Andree, police led Prada to a patrol car, where she was held until Metro Animal Control arrived, the police report said. Now, Andree visits her dog at Animal Control nearly every day. The $18-a-day cost of keeping Prada locked up is being charged to Andree. She owes Metro Animal Control about $6,000. Andree said she kept her dog in the house unless she was outside on a leash. She did not have a fence around her yard or a dog pen, but it was not required. Andree’s attorney, Jean Harrison, says that Prada doesn’t fit Metro’s definition of a vicious dog. says the pit bull isn't aggressive, it's merely "high-energy"
Prada is a high-energy dog that can put other dogs on edge, in this case leading to an altercation between dogs, according to Harrison. General Sessions Judge Casey Moreland said that’s not acceptable. 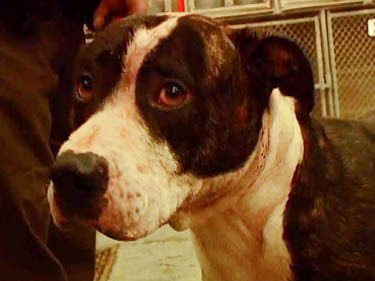 Moreland then upheld an environmental court referee’s decision that the dog be destroyed. A referee is a lawyer appointed to hear minor cases, including Metro code violations. Andree has had four lawyers, but her fifth one, Harrison, is representing Andree for free. ARIZONA -- Officers were forced to shoot and kill an aggressive dog in an apartment in Sierra Vista after it attacked its owner. The dog, thought to be a German Shepherd and Chow mix, bit its owner in her arm and head before police were contacted at 8:25 p.m. on Thursday and responded to Vista de la Sierra Apartments, 1555 Busby Drive, said Tracy Grady, public information officer for the Sierra Vista Police Department. When the officers responded to the apartment, they found the victim still inside the apartment with the dog,” Grady said. The first officer on scene, Detective Nick Lamay, managed to subdue the dog. As the dog continued to try and bite the detective, Lamay instructed nearby residents to help remove the victim from the apartment and to close the door behind them to prevent the dog from escaping, Grady said. A second officer soon arrived at the apartment, and, as the dog continued to bite at the officer and show other aggressive behavior, the decision was made to shoot and kill the animal. The same dog was involved in a similar incident earlier this year when, in August, it was quarantined for 10 days after it bit its male owner in the face, Grady said. At that time, and up through the incident on Thursday, the dog was confirmed to have been up to date on all inoculations, she said. The female owner injured on Thursday was treated at the scene for her injuries, but refused transportation to the hospital, Grady said. MARYLAND -- A Fruitland woman was taken into custody by police after a pit bull in her care attacked another woman, according to court documents. Keonta Anthony Quailes, a 21-year-old Morris Street resident, has been charged with second-degree assault and reckless endangerment. She is being held at the Wicomico County Detention Center on $25,000 bond following a District Court bail review hearing on Thursday. The most serious of the charges, second-degree assault, is a felony and carries a maximum prison sentence of 10 years under Maryland law. The charges stem from an incident in August when Fruitland officers were dispatched to Morris Street for a reported dog bite. When officers arrived, the resident told police the dog, which was being kept at her home, had bitten another woman. Quailes does not own the dog. She was caring for it for an individual who was incarcerated at the time, according to police. The victim was treated at Peninsula Regional Medical Center for her injuries. According to charging documents, the victim reported she walked up the driveway to the back door of the house on Morris Street when she saw Quailes, also known as "Tae," and a large pit bull known as Game. "(The victim) stated that Game was not on a leash or chain," wrote Officer James Kerr, of the Fruitland Police Department, in charging documents. (The victim) stated that she heard Quailes say 'get her.' (The victim) stated that Game immediately charged at her and attacked her." Quailes allegedly continued to yell at the dog, who continued to bite the victim's arms and legs, according to police. The victim alleged Quailes allowed the dog to attack her until a witness told her to pull the dog off. The victim was unaware of a motive in the attack. She suffered puncture wounds on her left ankle and injuries on the front and back of her left leg, according to police. Quailes denied the allegations of the intentional attack during a phone interview with police, according to charging documents. "Quailes stated to McLeod (of the Fruitland Police Department) that Game had 'popped' his collar and charged at (the victim)." A District Court trial for Quailes has been scheduled for early March. OHIO -- Mary McCoy sat in her Gary Avenue home’s living room pointing out the 300 stitches she received after her almost 2-year-old dog, Brutus, mauled her. On Dec. 20 McCoy, 63, was rushed to the hospital after her dog, a American bulldog and pit bull mix, attacked her inside her home as she was attempting to leave to the graves of her son and parents. “I told him he couldn’t come with Mommy,” she recalled. Standing at her door, the dog jumped on her and began biting her, pulling down on to the couch. She sat in the living room where she was attacked, describing how he it happened. Wounds and bruises cover the top part of her body, there is a cast on her left wrist, which she says is to help her thumb which was almost torn off in the attack. She spoke of her attempts to get away from the dog and how she pried open his jaw that was clamped around her neck, before wrapping herself in a blanket as a means of protection. “I remember thinking this is how I am going to die,” she said. At first, the thought didn’t bother her, because she would be with her son who died two years ago from cancer. But it was the thought of her 25-year-old grandson that made her get up and call for help. She called her brother-in-law Larry McCoy for help and he came running over from his home next door. He called police and paramedics to the home. “Every time I would breathe, blood would just come gushing out he said,” she recalled. Roughly eight months prior to the attack, she received the dog from a man claiming to know her son. He told her that he and his wife were separating and he could not keep the dog. He had heard that her pit bull had passed away earlier, so asked her if she would take Brutus. When she hesitated he stated he was going to go “blow the dog’s head off,” so she agreed to take the dog. Talking about how good of a dog Brutus was made her question exactly why he attacked her in the first place. “I’m stunned, I’m shocked, I don’t know what to say,” McCoy said. 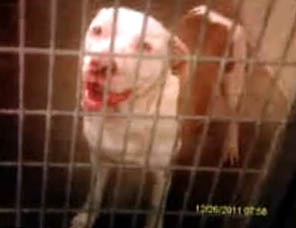 The dog warden took Brutus to the county pound to be quarantined. “I’m hurting so badly,” she said when talking about Brutus being in pound. The more she talked about Brutus’ fate, the more her sympathy for the dog showed. 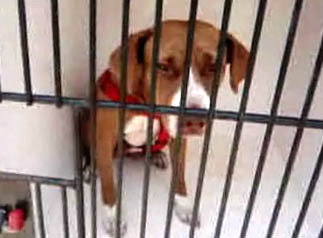 She has to papers, as yet unsigned, to have the dog euthanized. Those tears quickly turned to anger as she talked about hearing that she is not the only person who has been attacked by Brutus. Earlier this week, she said she learned that he had mauled another person just prior to him being dropped off at her doorstep. 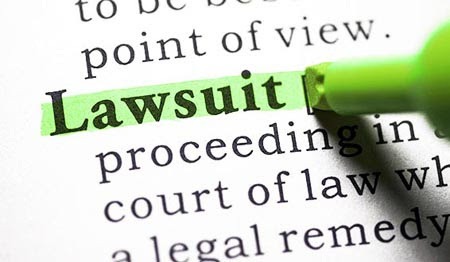 Those surrounding her have said that she should consider suing the former dog owner, however, she is unsure if she will take that course of action. Regardless of Brutus’ past, she still can’t help but be sad about having to put the dog to sleep. She understands it has to be done, so he cannot be adopted out to any other family. “What if this would have happened around kids,” she said. While the dog was more of her grandson’s, who had lived with her, she loved and cared for Brutus. She stated that when he left, the dog began to change a bit. But talking about what happened and how the dog acted, she just kept repeating her shock at what he had done to her. She will be the first to blame it on the dog, not the breed of the dog. “It’s not because he was a pit bull,” she said pointing out that she had a pit bull for 14 years and never had a problem with him. Her physical recovery will be lengthy. “I have already had one plastic surgery,” she said. She has more surgeries to go through, but said physically she feels a little bit better each day. he viciously attacked his owner Mary McCoy. She has no plans to get another dog anytime soon out of fear of the dog turning on her. 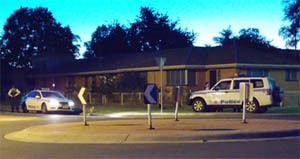 AUSTRALIA -- A WOMAN had the top of her thumb severed in a dog attack at her South Albury home last night. The 64-year-old was attempting to separate a Neapolitan mastiff and her own dog, believed to be a wolfhound or staghound cross, after they began fighting about 8.15pm. Police unsuccessfully combed the area around the woman’s Hovell Street unit in a bid to find the top half of the woman’s thumb. It is believed she may also have suffered a broken finger and other abrasions in the attack. She was expected to have surgery on her hand last night or today. 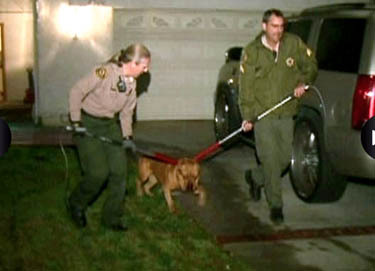 The mastiff belongs to the girlfriend of the victim’s son. It is believed to be the second attack by the dog in the past week, though the first attack was unreported. The Neapolitan mastiff is not a restricted dog breed. According to the Neapolitan Mastiff Club of NSW, the breed is “physically impressive, foreboding and massive”. “A heavily-built, massive dog that easily weighs 70 to 90 kilograms,” the club’s website says. “The bones are huge, often like tree trunks on the end of the body. “His paws are wide and very cat-like in structure. His broad head is imposing, his large lips hang past his muzzle and his eyes are slightly shielded by heavy wrinkling. 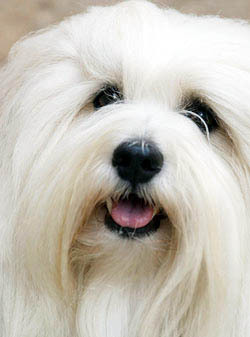 The club describes the dog’s character as being completely devoted to its owner and foreboding to intruders. 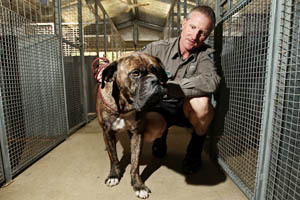 Albury council’s acting team leader compliance Darren McFarlane secured the dog soon after the attack last night. He said the dog was in the yard at the rear of the Hovell Street property and showed no aggression as it was seized. He said the future of the dog would depend on consultation with the owner. 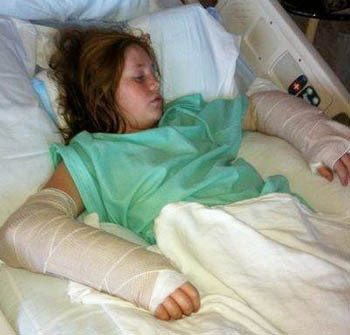 FLORIDA -- The father of an 11-year-old girl badly mauled by her friend's pit bull earlier this week says the sixth-grader could be sidelined by her injuries for up to a month as she struggles to recover from multiple bites and fractures to both arms. The attack happened about 5:30 p.m. Wednesday as the unidentified child was leaving a home in the 1400 block of Carpenter Road in Titusville when the 50-pound adult dog - who has no record of vaccinations - broke loose from its tether. "He got out of his collar. She was scared for her life...she was thinking she had to block her face while it was on top of her," said Allen Lockhart, the stepfather of Trinity Ciolfi. The girl was rushed to Parrish Medical Center with two broken arms and multiple lacerations caused as she struggled in vain to keep the dog from biting her. A large chunk of flesh from one arm was also ripped away by the dog, officials reported. "Right now she's just in a lot of pain. She can't do a whole lot on her own," Lockhart said. The dog, named Duke, was signed over to the county by the owner, Robert Grafing, after law enforcement agents and animal services officers arrived, reports show. Investigators plan to fine the owner and have the 50-pound canine euthanized. “She was over visiting and was leaving when it happened,” said Sgt. Chris Robinson of Brevard County Animal Services. “She was alone and was getting on her bike and the next thing she knew, (Duke) is attacking her. The dog was tied to a tree and somehow broke free. The owner heard the cries and got the dog off of her,” Robinson said. The dog is now under a 10-day quarantine at an animal shelter. Animal services investigators also quickly determined that the canine has not been vaccinated as required by law. “He didn’t have anything, no shots,” Robinson said. Robinson said investigators will ticket Grafing for not having any current rabies shot, for failing to secure the dog and for an attack leading to severe injuries. The dog does not have a previous history of attacks, Robinson added. An investigation into the attack is ongoing. The girl continues to recover from her injuries. COLORADO -- Aurora police are asking people not to let their kids or dogs outside unattended while they search for two aggressive dogs involved in an attack that left three people injured -- one seriously. The attack occurred Friday morning in the 19200 block of East Gunnison Circle, near South Dunkirk Street and East Jewell Avenue in the Louisiana Purchase subdivision by the Buckley Air Force Base. A woman was walking her small dog (described as a Havanese) when it was attacked by two larger dogs, described by several witnesses as pit bulls, said Aurora police spokeswoman Cassidee Carlson. While trying to protect her dog, the woman was attacked by the larger dogs, Carlson said. A neighbor, Cheryl Schultz, said she was preparing to go to work when she heard the woman screaming and the dogs barking and she ran out to help. Schultz said she saw the woman tackling one of the larger dogs to the ground and saw the other pit bull attacking the smaller dog. 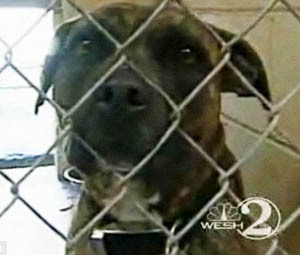 "I did not realize they were pit bulls 'til I went outside," Schultz said. "If I had known, I would have armed myself." After yelling to try and stop the attack, Schultz said she tried to pull one pit bull away. That's when both dogs lunged at her, she said. Schultz tried to run back home but was knocked to the ground, Carlson said. With the dogs distracted, the first woman and her small dog jumped into the back seat of a car whose driver stopped to help, Carlson said. Schultz's husband ran outside and helped her scurry back to their apartment. Shultz said she was inside her apartment, calling 911 when she looked out her window and saw a third person -- a man -- being attacked by the two pit bulls. The man, another neighbor, had yelled at the dogs to distract them. They then turned to him and were able to bite him a couple of times before he escaped by jumping onto the roof of a car, Carlson said. Both women were transported to the hospital. Schultz was released with several stitches to her leg. She told 7NEWS that the woman who was walking her dog remained in the hospital with serious injuries to her arm. The two larger dogs -- a black dog and a brindle-colored (brown with black markings) dog -- remain on the loose. Officers went door to door trying to find the owners of the two dogs. Schultz said there was a blue plaid neckerchief on the brindle-colored dog but did not see a leash on either dog. Schultz said she's never seen the other woman before and had never seen those pit bulls in the neighborhood. 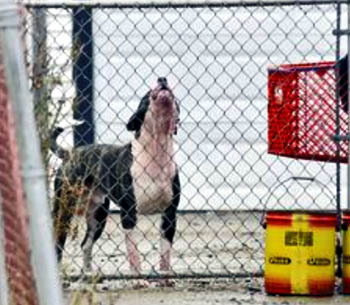 "Officers are going to houses in the area where restricted breeds are registered. Citizens are advising officers of where other large dogs may live and police are knocking on doors trying to find the owners of the two dogs who still remain at large," Carlson said. If you see a dog matching this description running loose, call 911, police said. Animal Care was called to the scene to assist. The little dog was taken to Alameda East Veterinary Hospital, where its condition remains unclear. On October 2005, Aurora banned three breeds from within the city limits: an American Pit Bull Terrier, American Staffordshire Terrier and Staffordshire Bull Terrier. 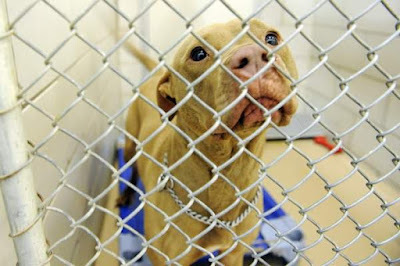 Pit bull owners who were already living in Aurora were allowed to keep their dogs under a grandfather clause that required them to get a Restricted Breed License. Residents who violate the pit bull ban are subject to impoundment of their animal, a summons and court appearance. If convicted in municipal court, the minimum fine is $700 and/or up to one year in jail. UNITED KINGDOM -- A blind woman has described the moments she was left panic-stricken when her guide dog was set upon by a crazed terrier. Jessica Hodgson, 47, was being led by two-year-old yellow Labrador cross retriever Olly along Church Road in Haydock when it was savaged by the dog that had dashed out of a nearby house. Olly, who was being taken to the vets for a six-monthly check up, was bit on the head and body before a member of the public wrestled the animal off. Jessica said: “We were about 50 yards from the vets when this dog just flew out of a house and jumped on Olly, sinking his teeth into him. He was on the back of Olly, who was defenceless because he was in a harness. “A passer by managed to drag the dog off. If he hadn’t I don’t know what would have happened because he was just not going to let go. “It was really frightening I did not know what was going on. I was being shaken about by Olly trying to get him off. Some of the nurses came out of the vets to help me and took Olly. Jessica’s civil partner, Lee Hodgson, 43, who is also blind, said: “She could do nothing to stop what was going on. It was terrifying for her. “Jess could just hear her dog squealing. It was only the actions of a neighbour called Tony – who had to grab the dog by the nether regions that stopped the attack. The Guide Dogs for the Blind Association have been assessing Olly to check whether psychological harm caused by the attack will impair his ability to work. Police confirmed officers were called to Church Road on Wednesday, December 14 after receiving a report that a guide dog had been attacked by a Staffordshire Bull Terrier. Inspector Steve Lowe said: "We take all incidents where dogs are deemed to be dangerously out of control extremely seriously. "We are investigating the case and appeal to anyone with any information about the incident to contact us." David Cowdrey, Guide Dogs' head of public policy and campaigns, said the incident mirrored a national trend. On average, there are more than seven attacks on guide dogs each month by other dogs. This number has more than doubled since last year, with a previous study on dog attacks, published in June 2010, showing an average of three attacks per month. Bull terriers, Staffordshire bull terriers and pit bull terriers are among the most frequent offenders, according to report by Guide Dogs that was published in September. In more than nine out of ten cases, attacks took place in public places such as parks, town centres and shopping areas Mr Cowdrey added: "We are hearing more and more about attacks on guide dogs by other dogs. 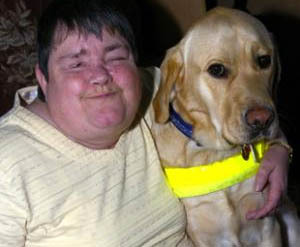 “They have a huge impact on the dog itself and the owner, who relies on their guide dog to live independently. In the worse cases, they can lead to a guide dog being retired early. "We want compulsory microchipping of all dogs in England and Wales, and we want police forces to take these attacks more seriously." CALIFORNIA -- An investigation is underway in Fullerton after officers called to a home where a toddler was bitten by a pit bull found "a significant quantity" of marijuana, Fullerton police said in a news release. Police and paramedics responded to a home in the 2500 block of Larkwood on the night of Dec. 26. The mother of a 2-year-old boy had run to a neighbor with her 2-year-old son, Fullerton Police Sgt. Andrew Goodrich said. She asked the neighbor to call paramedics. Fullerton Fire took the toddler to an area trauma center, where he was treated for a 7-inch laceration on his head. The mother was house-sitting for a friend, and does not live at the residence where the attack happened. She told authorities she stepped out of the room for a moment, then heard growling, following by her son screaming. When she ran back into the room, she said, she saw the dog standing over her child, who was bleeding from the head. Officers searching the house found marijuana growing and being processed inside. 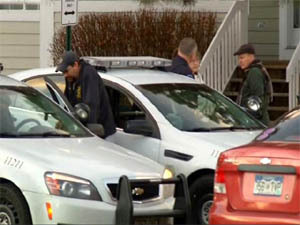 Police contacted the homeowner, but no arrests have been made. Detectives are investigating both the marijuana cultivation and possible child endangerment. NEW ZEALAND -- A vicious and unprovoked attack on a Palmerston North pooch has the dog's owners angry and wanting to track down the "chap and his dog" responsible. 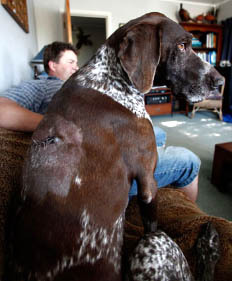 Christmas was marred for the Cousins family after their German Short-Haired Pointer, Maddie, was attacked by another dog while they were walking on the Wilderness Walkway, near Brightwater Tce, about 1.30pm on Friday. The walkway is one of the few areas left in the city where dogs can be let off their leashes. Gary Cousins was walking their three dogs when a dog came running towards them. "It was like a lion," he said. "It jumped on Maddie's back, she screamed and yelled. She just crouched down and whimpered. I had a stick which I usually carry and I whacked the dog with it. If I hadn't had that stick, I don't know what I would have done." He said within a split second the dog had ripped a 3-centimetre deep gash in Maddie's back. "It was awful. I keep lying in bed and remembering it. I'll be a bit timid and nervous next time I go walking." Mr Cousins and his wife, Helen, took Maddie to the vet, where she had more than $500 worth of surgery. Mrs Cousins, who planned to report the attack to the Palmerston North District Council, said it was lucky her husband was carrying a stick. "At the time my husband spoke to the owner who said 'Sorry mate, I didn't see you'," she said. "He obviously knew his dog was a problem but let it off anyway. There wasn't time to exchange details so we are yet to track him down and ask him to pay ... Our concern is that this dog will attack other dogs and potentially could accidentally harm a young child if they were to be walking their dog." The Cousins have walked their dogs along the walkway for more than 30 years, and have never had any problems. "We'd like to find the chap and his dog," she said. "We know who he is, we just don't know his name. My husband has seen him many times walking his dog." WISCONSIN -- An attack by a family dog sent two Adell women to the hospital Thursday, one with facial injuries that will reportedly require reconstructive surgery. Lt. Jim Risseeuw of the Sheboygan County Sheriff's Department identified the victims as 42-year-old Priscilla Biermann and her daughter, Niklea Drake, 23. Adell Fire Chief Will Schneiderwent said the incident occurred at 11:30 a.m. at 104 Seifert St.
Risseeuw said the dog initially bit Drake, who sustained injuries to her face, neck and arm. Biermann was bitten in the face when she tried to intervene, losing a large portion of skin from her cheek. Scanner reports said Biermann was expected to need reconstructive surgery. Both women were taken to Columbia St. Mary's Hospital Ozaukee for treatment. Risseeuw said there was no immediate indication why the dog attacked, though the owners noted the dog was unfamiliar with Drake, who had recently moved home. The dog — a German wirehaired pointer — was taken to a veterinary clinic where it will be quarantined for the required time period before being euthanized, per the owners' request. Responding agencies included Adell First Responders, Random Lake Ambulance, Plymouth Ambulance and the Sheboygan County Sheriff's Department.